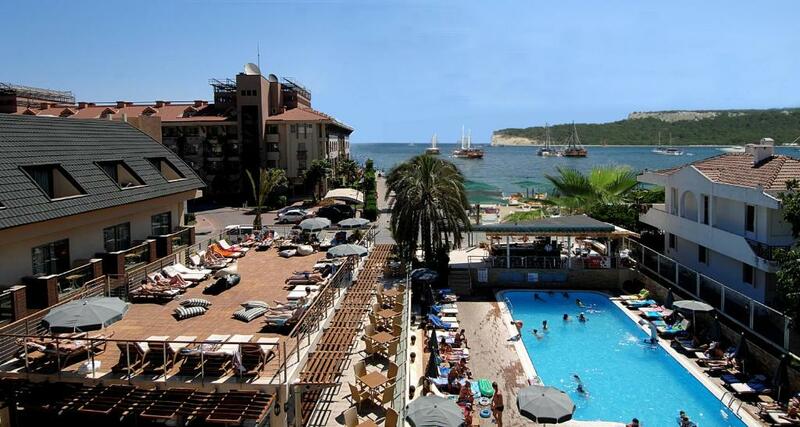 The location is in the heart of Kemer, the beach is very nice. staff was polite and helpful. meals were ok. room was very comfortable. it is a nice hotel. The group of hotels is centrally located in an area with paved streets, so there isn't much traffic. The pool water was really clean, perfectly transparent. Our double bed was great, made up of a large mattress with a thinner one on top. The room had an excellent air conditioning unit, which was really useful, as at night temperatures stayed at around 30 degrees C. We had access to two pools, one at our villa and one in the main hotel. Some people in the staff were very friendly and helped us get an airport transfer for our last day. Location was nice next to the sea, the food and the cuisine was fair to very good. Suitable for families and couples. 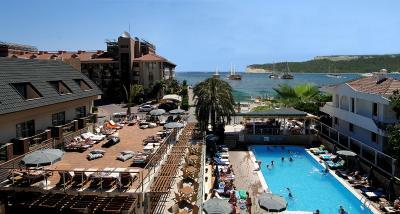 The hotel is located very close to all the services of Kemer and to the beach. Recepcion staff is very helpfull and kind. The beach of this hotel is easily accessible and well organized. The location of the hotel is very good as the centr Kemer is in a walking distance and also it is easy to walk to the beach. The spa staff r not really friendly.They should changed towels every 3 days...always was a problem. The bed linen should cnahged every second day,but changed just 3 times for 18 nights.Even we r put green light for cleaning.Wifi....is not really free.And...first time for travel paid for the safe.So..plus extra 50 euros.....plus extra 120 euros to Airport. Anyway,we had a good time.Big thanks for manager and staff of the restaraunt-Hussein,Mystafa. Big thanks for Aigyl-who works in the pool bar. Staff was very kind and pleasant. Food was great, drinks & the overall service was excellent. Rooms are good and very clean. The staff was perfect. They helped us with our 7 month baby preparing for him the lunch and the dinner as requested from the mom. Ambassador Plaza This rating is a reflection of how the property compares to the industry standard when it comes to price, facilities and services available. It's based on a self-evaluation by the property. Use this rating to help choose your stay! One of our best sellers in Kemer! Offering private beach access with free use of sunbeds and parasols, this hotel offers many ways to relax, close to the center of Kemer town. Ambassador Plaza provides rooms either with swimming pool view or with sea view or mountain & garden view. All rooms include a seating area, separate bathroom with bathroom amenities, and facilities such as air conditioning, a safety deposit box, satellite TV and tea/coffee making facilities. The property offers a spa, children’s playground, restaurant with 450 people capacity, à la carte restaurant with 130 people capacity, 4 bars, hot tub and a jet pool, spa center, 2 swimming pools with children section, water slides, waterfalls, private garden, and indoor activity rooms. The nearby Kemer center provides interesting shopping opportunities as well as a vibrant night life. Antalya International Airport is 1 hour drive away, 37 mi, from Ambassador Plaza. 뀐 Located in the top-rated area in Kemer, this property has an excellent location score of 8.0! When would you like to stay at Ambassador Plaza? Air-conditioned room with flat-screen satellite TV and a balcony offering mountain views. Please note that safety deposit box costs EUR 2 per day. Air-conditioned room with flat-screen satellite TV and a balcony. This twin/double room has a balcony, electric kettle and seating area. This triple room features a balcony, flat-screen TV and bathrobe. Ambassador Hotel has ISO 22000 Food and Beverage Safety Management System-ISO 14001 Environement management System,and Golden Greening Hotel certificates. Also the hotel is Green Starred by Tourism Establisment by Ministry. House Rules Ambassador Plaza takes special requests – add in the next step! Ambassador Plaza accepts these cards and reserves the right to temporarily hold an amount prior to arrival. Activities Free of Charge: Turkish bath, sauna, fitness center, water slides, outdoor hot tub, wireless internet, table tennis, beach parasols and deck chairs, swimming pools, playgrounds, car park. Activities with Charge: Spa Center, steam bath, massage, peeling, water sports on the beach, safe box, mini bar, room service, a’la carte restaurant, telephone, fax service, hair dresser, dry cleaning, laundry service, photography, baby sitting, doctor, billiard, table football, table hockey. Please note that free WiFi is limited with 300 MB per person. Limitless internet is offered at an extra fee. We reserved a room in Ambassador Plaza, but we were given one in Amsterdam Otel (a villa, rather than a hotel). The room was nicely decorated, but we didn't have a minibar (which was supposed to be in the room) or chairs; we didn't have a balcony, since we were on the ground floor (the balcony would have been really useful). Instead, we had a folding bed in our room in the place where initially the balcony had been. This room would have been perfect for a family with a kid, not a couple. We didn't have a place to dry our towels, so we improvised. The furniture and furnishings we did get were new, so there was no issue there, but we only got one thin blanket for a person and there was one thicker blanket for the folding bed, that we used instead of the normal thin blanket we should have had. Nobody at our hotel spoke any English, so we couldn't ask for an extra thin blanket. We did manage to get a chair, but no minibar. When we first entered the room, there was a heavy smell coming from the floor made up of ceramic tiles. I don't understand how they cleaned that floor, since it was dirtier than the pavement outside and quite yucky. There were smudges of varying degrees of brown and some hairs mixed in there. We didn't take off our slippers at any moment during our stay. I would have washed that floor myself, but I didn't have any tools or washing liquid. Also, when we first entered the room, the linens looked as if they hadn't been cleaned or changed, but we decided to trust the staff and hope everything would be all right. On our first day, as we arrived before 2 PM, we had to leave our luggage in the lobby of the main hotel for many hours before we got a room, but at least we were invited to have breakfast or lunch while we waited. The food was decent, but there was very little variety and many of the foods were really spicy, so I couldn't try many dishes or I would get sick from the spices. The hotel offered a room much smaller than the picture and additionally the hotel itself had way smaller facilities than it was advertised. This condition created crowd in beach in to extent that people could not find a place, the same applies as well in the restaurant for the lunch hours. One more comment should be added about the cleaning level which was average but I guess this is connected with the fact that the hotel was operating in full function due to the high season. They charge an extra fee for internet (3e/day) after you've used your free 300MB. The service at the reception was good (but slow) in mandatory things but they weren't any helpful in any additional questions. All inclusive does not occur in the beach, where only water and tea is for free between 10-16. Cleaning was allright in the rooms, but common areas could have been cleaner. Unhelpful staff and Raised. The AC wasn’t working and they sent me some one to fix it instead of that he came and told me to take of my shirt!!!!! Worst days of my life because of the hotel. Never go back ever if for free. This hotel likes to show higher standard but there are problems with room cleaning, there are problems with theirs restaurant as theirs offer for the bufet (braekfest, lunch and dinner) is very limited, no good quality and the quantity is always not enough. staff was friendly and polite . clean . The pool is very clean.The food was very good.And,of course staff r very friendly,helpful. - The staff is careless, if the table in the restaurant was used before you, they will not clean it and will not bring a new set of utensils for you, you have to tell them. And once they bring these, it will never be complete. - Do not dare to come to the restaurant 1 hour after the said time, you cannot find any hot meals. - At the end of the day, you might come back to an uncleaned room even though you wanted cleaning. - Contrary to the advertisement, the hotel is not "all inclusive". If you want a cocktail from the pool bar, you have to pay. (even for a simple one such as mojito) (When we raised this issue, the management decided to give away free punches, yaay!) - For the beach bar, you can only have tea and water for free, all else is subject to charge (wohooo we are going to an all inclusive hotel yaaay). And they wont even replenish the tea if its gone, even though it is 15:30 and the bar closes at 17:00. - Get ready to play "who will get to keep the sunbed for 12 hours straight even though they are not in the beach" with the many Russian customers. Free wifi means only 300mb the mini bar is empty not even turned on you get one bottle of water when you check in then If you need more you fill that bottle up from the water fountain. You need to pay extra if you want to use the room safe. The air-conditioning in my room didn't work well. The soap dispenser in my shower was more water than it was soap. Internet is limited to 300 MB per person for the entire stay, and if you use that up, you have to pay for internet additionally. I didn't like the beach too narrow.